1. 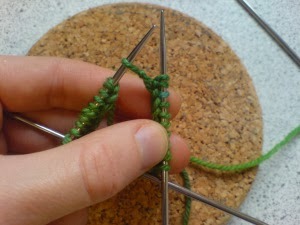 When working with DPNs, after making sure your stitches are not twisted, cast on one more stitch. 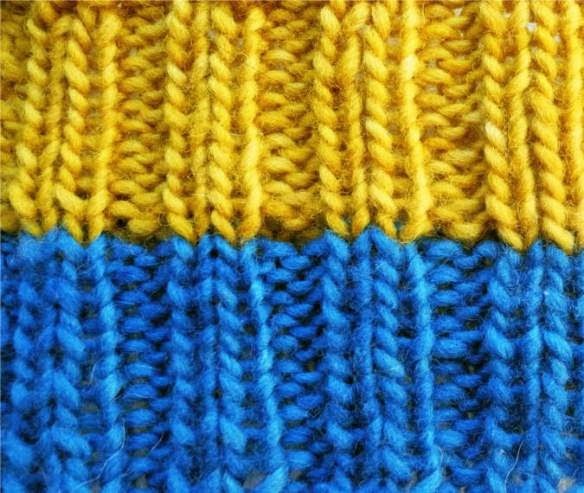 Bring this stitch to the first left hand needle, then work it together with the first stitch of the round, ie k2tog or psso. This will give you a nicer edge. 2. Be aware of the jog when working stripes. 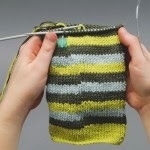 Knit one round in the 2nd/contrasting color. On the second round, slip the first stitch purl wise (don't knit or purl it) of the round, then continue in pattern as normal. This will pull up the stitch and for the most part hide the jog. See The Knitter for help. In their photo, you can obviously see "the jog" at the bottom and then jobless at the top. 3. 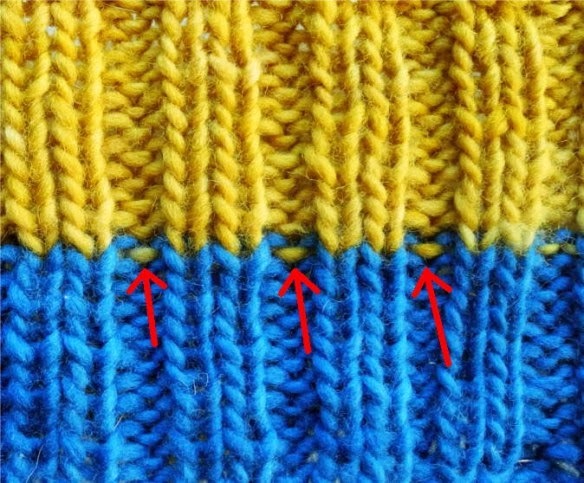 To avoid "purl bumps" when working rib and changing colors, once you change colors, knit the next row, then continue in rib. 4. When working a heel flap of a sock, always slip the first stitch of each round as if to purl (while working back and forth.) 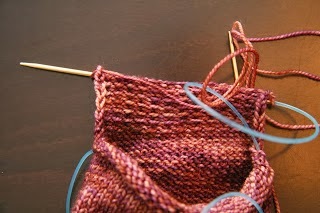 Knit the second stitch and slip the next purl wise. Knit and slip to end for a sturdy heel. See the post from K-Line. See the very nice slipped stitch edges? 5. 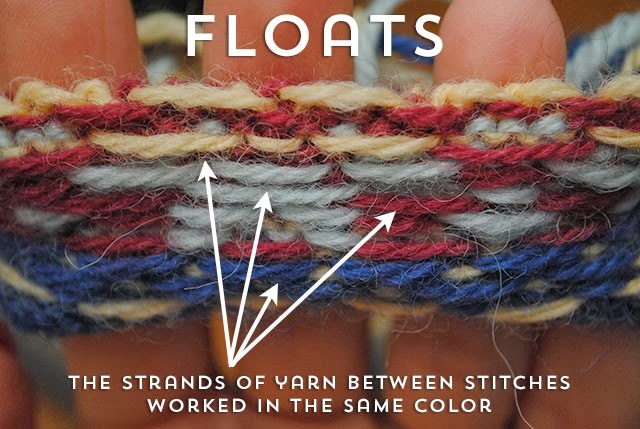 In Fair Isle Knitting, trap your floats. By Gum, By Golly shows it nicely. 6. When knitting with smaller needles and changing to significantly larger needles, you may want to decrease by a few stitches. Say I am working a K1P1 rib (with edge stitches) for a total of 65 stitches, with US 4 needles and DK yarn. When I'm done, I need to switch to size US 7 needles and stockinette stitch. On that first knit row when changing the needle size, decrease by 5 sts so you now have 60 sts. This will make the piece look more uniform. I almost never check my gauge, or I check what my gauge is after I work a few inches. Then I measure that to what size the pattern is - like a baby sweater. There could be sizes from newborn to 2T, and I could start with the largest size, but my sweater may come out for a 1 year old. This is totally fine for me since I am usually not making the garment for anyone specific. 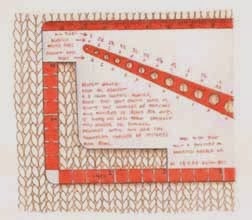 This is a great Gauge article from Ezine Articles. Also a good piece from WoolFestival. Gauge is important if you want something to fit someone in particular. Then comes the element of design. You may need to measure, then multiply by the gauge, and do some more math. But it's all FUN.